McLaren insist there is nothing fundamentally wrong with their team despite their continuing poor form. Both drivers finished outside the top 10 in Sunday's Chinese Grand Prix to underline McLaren's struggle for pace. But racing director Eric Boullier said: "There is nothing fundamental. This team has good individuals." 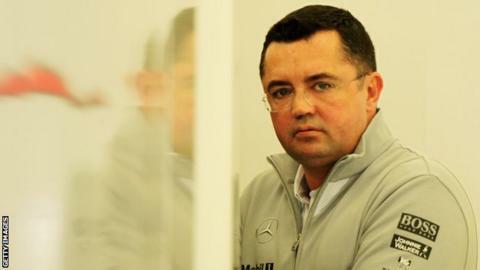 Boullier, a replacement for former team principal Martin Whitmarsh who was sacked in January, admitted his task was to "rebuild a winning team". In 2013, McLaren slumped from winning seven races the previous season to not registering a single podium finish. It was their worst year since 1980 and prompted chairman Ron Dennis to re-take the reins of the F1 team and dispense with Whitmarsh, his long-time protégé. Drivers Kevin Magnussen and Jenson Button finished second and third in the season-opening Australian Grand Prix this year but the team have fallen backwards dramatically since then. In China, McLaren were comfortably the slowest of the teams using the dominant Mercedes engine, and were beaten by several cars using the less competitive Ferrari and Renault power units. Button finished 11th and Magnussen 13th. Boullier, who started work at the end of January, suggested McLaren needed to look again at some of their working methods, saying: "We just need to reconsider a little bit strategically how we build our car and develop our performance." He also rejected a suggestion that this season was effectively about marking time as they prepare for a switch to new engine partner Honda in 2015. "You can't allow yourself to think and wait in motor racing," he said. "Then in the middle of this we have this extra challenge to work very efficiently with our partner Mercedes and then later in the year to start to integrate Honda arrival. But it's just part of the challenge." Boullier said the team had a number of new parts planned for the forthcoming races, starting with what he described as "an interesting upgrade" for the next race weekend in Spain from 9-11 May. And he said McLaren still believe they could back up Dennis's pre-season claim that they would win a race this year. "We have to believe we will win a race," Boullier said. "What is going on here in Woking is very positive and I think we will be able to keep pushing and bring very aggressive and strong development for the course of the season. "And I think we will put ourselves in a position, maybe not in the first part of the season but maybe later, to fight for a win. I hope so."